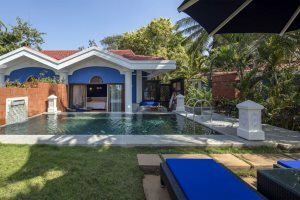 Set directly on the beach in lush manicured gardens filled with tropical flowers and coconut palms, the Taj Exotica Resort & Spa promises a captivating luxury experience in Goa. The wide range of facilities and activities on offer including yoga sessions, tennis, archery, pool and golf. The Jiva Spa – sample their wide range of treatments including time-honoured Indian therapies. We just adore the Pool Villas and highly recommend that our guests upgrade. There are only a few rooms available, so book early to avoid disappointment. 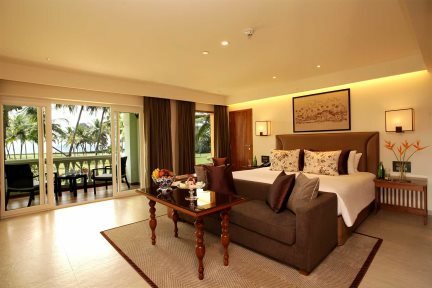 More than living up to the quality reputation which comes with the Taj group name, Taj Exotica Resort & Spa is a luxurious, palatial hotel with something of a colonial style in terms of its architecture and design. Grand polished marble floors, beamed wooden ceilings and antiques all add to the hotel’s character and charm, flaunting a stylish and affluent appeal that adds to the memorable aspects of a stay at this luxury hotel. Located along the white sands of Benaulim Beach, the Taj Exotica Resort & Spa is spread over 56 acres, enjoying spacious grounds and ample facilities. Peace and tranquillity are easily found in its lush manicured gardens, while activities can be enjoyed in the shape of several sporting opportunities. Relax by the large swimming pool or on the palm-fringed beach, unwind in the Jiva Spa and sample their range of treatments including ancient Ayurveda, or try one of the many activities available including golf, tennis and open-air yoga sessions; there’s so much to do here. 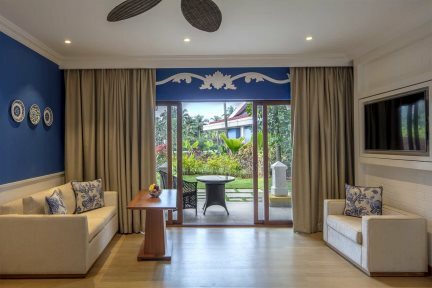 When it comes to the rooms, you’ll enjoy spacious and comfortably decorated choices, harmoniously blending Goan and Portuguese influences. 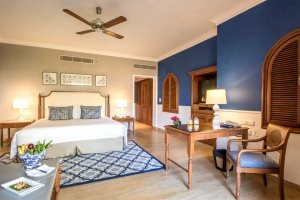 The recently renovated Deluxe rooms are set in the main building, while the Garden villas and Pool villas are scattered within the gardens. 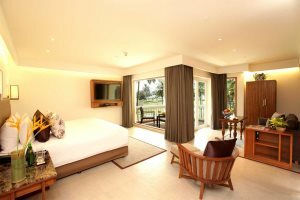 You’ll enjoy a great range of features in the rooms, including air-conditioning, a minibar, a television and tea/coffee-making facilities. Food lovers will rejoice in a stay here too, with a wide range of dining experiences to choose from. You’ll experience everything from casual eateries to fine dining, with the best of Goan seafood, Mediterranean, Arabic and Oriental cuisines all on offer. 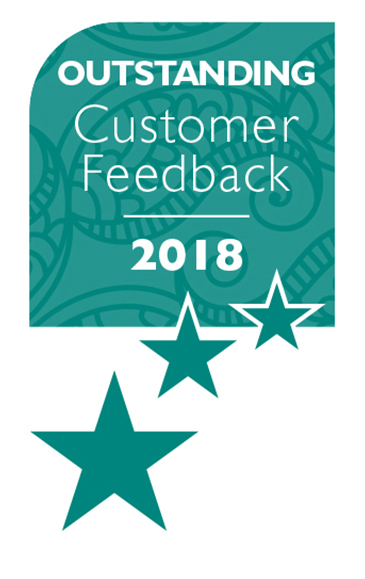 "With personal service and superb attention to detail, the staff at Taj Exotica always go the extra mile to make all their customers feel welcome." The renovated Garden Villa rooms are set in the grounds and have a balcony or terrace. They are decorated in a colonial style and include a King size or twin beds and bathroom with shower. Recently renovated, the Deluxe rooms are located in the main building and have a balcony or terrace with views over the grounds and out towards the Arabian Sea. They are stylishly decorated in a colonial style and include a King size or twin beds and bathroom with shower. 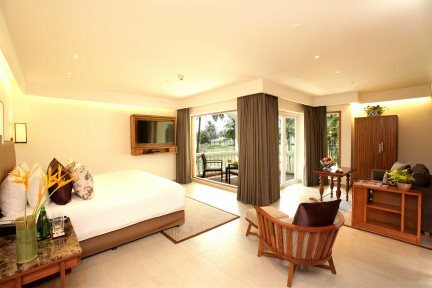 The Premium Garden Villa rooms are set in the grounds and have a balcony or terrace. They are slightly larger than the Garden Villas and have been renovated and furnished to a slightly higher standard.. They are beautifully decorated in a modern yet colonial style and include a King size or twin beds and bathroom with shower. Recently renovated, the larger Premium rooms are located in the main building and have a balcony or terrace with views over the grounds and out towards the Arabian Sea. They are stylishly decorated in a colonial style and include a king size or twin beds and bathroom with shower. The Pool Villas are located in the gardens have their own personal plunge pool. They are decorated in a colonial style and include a King size or twin beds and bathroom with shower.